Therapeutic ultrasound is a lie. The emperor has no clothes! He’s stark naked and you can see all his woolly bits! Physiotherapists have an on-going love affair with therapeutic ultrasound, and why not? It looks and sounds space-aged, and promises to heal everything from scar tissue to calcium deposits; from muscle spasms to nerve root irritation; from drug delivery to bone healing – all with little to no negative side effects. But it’s all a bit of a hoax really. You see whatever else you say about ultrasound, one thing is for sure; it’s very easy to study. You simply run a double blind test where one ultrasound machine produces ultrasonic waves the other just looks like it’s switched on but actually does nothing – a placebo. There has been a lot of these sorts of studies done over the past couple of decades and almost without fail the high-quality studies all reach the conclusion that ultrasound doesn’t outperform the placebo in any meaningful way. That was more than a decade ago. So you’d think physios around the world would have moved the ultrasound machine into the cupboard and switched to more well-proven techniques. But no, they’re still out there in use today. A 2007 survey of American physios found that about 83.6% were likely to use ultrasound to decrease soft tissue inflammation, 70.9% used it to increase tissue extensibility and 68.8% used it to increase soft tissue healing. I haven’t seen similar studies from New Zealand but if such a study were done, I’d expect to see the same sort of results. Okay so if the evidence for it is so sketchy, then why do physios still use it? Well that’s the really interesting part. Every time a study says that ultrasound is no more effective than a placebo… it’s not saying that the client doesn’t get better. What they’re saying is that the improvement is likely to be a result of the placebo effect in clients’ heads rather than ultrasonic waves coming out physios’ wands – but at the end of the day people are still getting better. Lying is bad, but easing suffering is good – every school kid knows that. But what if the lie eases someone’s pain, then it’d be good, no? But what if someone’s making lots of money out of it, that’d be profiteering wouldn’t it and that’s bad – surely making money out of lying to people can’t be good? But what if the act of handing over money helped convince someone the lie was true, which eased their pain, then it’d be okay, wouldn’t it? But what if that money could have been spent on actual proven treatments – what if we could have cured malaria with the money westerners spend on fancy placebos – can’t we just give ‘em a sugar pill? So what do we do? Do we lie and use the placebo, or do we tell the truth and use an actual treatment – and if we choose to lie, how much should we charge for it? Please write your answer on a signed self-addressed envelope and leave it at The Studio’s reception. If you’re correct then you win a cut of the proceeds we’ll get selling that answer to the rest of the medical world – because everyone from plastic surgeons to proctologists would love to know! 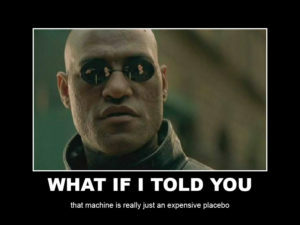 Yep the placebo is the medical world’s most jagged ethical pill. We’re not saying that we don’t use it – in fact it’s almost impossible not to – just acting in a professional manner around clients is likely to bring it on. But when the placebo effect becomes the driving force behind your treatments then in my opinion you move out of the medical sphere and into the realm of faith healers, homeopaths and reiki masters. And that is why we don’t use ultrasound at The Studio.